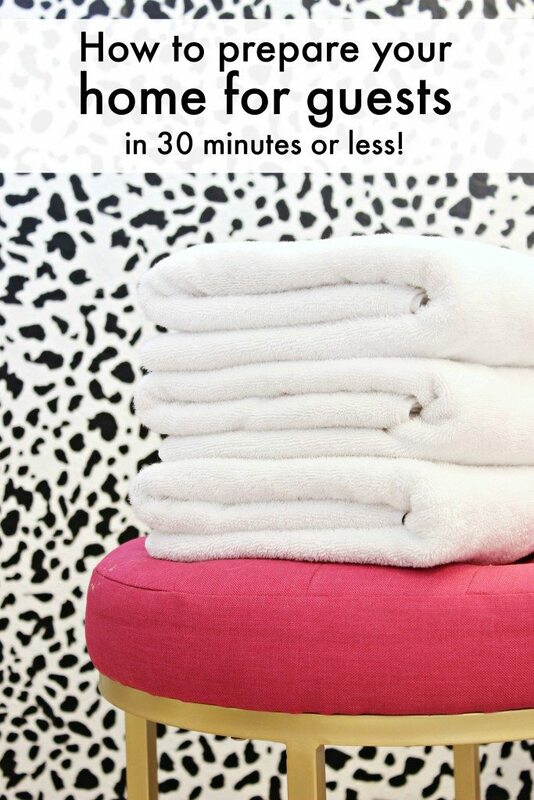 How to prepare your house for last minute guests in 30 mins or less! This post is sponsored by Dyson. I was given product in exchange for the item’s review. All opinions and obsessions with the product are my own. Seriously. How to prepare your house for last minute guests in 30 mins or less! Since we moved back to Arizona, we have had a lot of house guests. Something we RARELY had in New York. It’s always a treat to have friends and family in from out of town. My husband’s family has flight benefits and we’re so lucky to have them to come visit pretty often, even if it’s just for a night. That being said, sometimes my home is not “guest ready”. Today I’m going to show you my tips that I’ve used to get my house ready in a hurry! Quick pick up – One thing I have tried really, really hard to do in our house is to make sure everything has a “home”. Every. Single. Item. I want to be able to put EVERYTHING away and for everyone in the house to know where it goes. I use a lot of labels, bins and drawers for storing things. Vacuum all surfaces of flooring, sofa and car. This takes a good 10-20 minutes or so but it makes a HUGE difference. 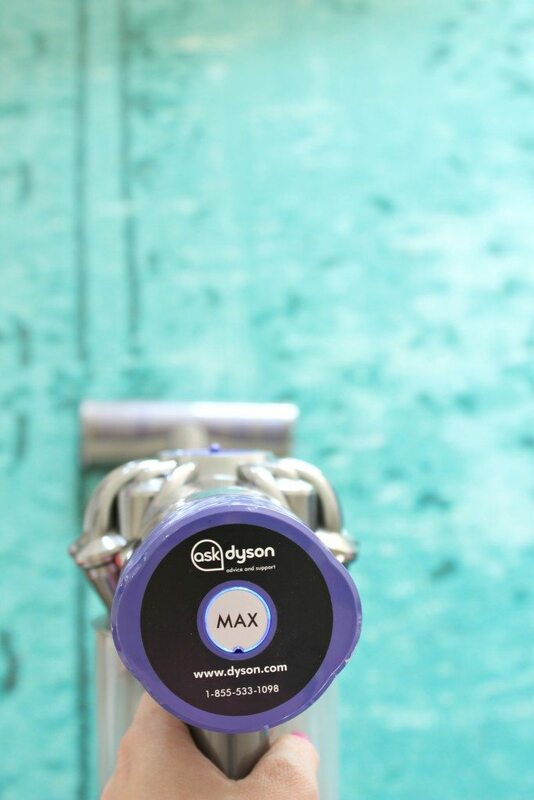 I’m going to chat about my Dyson here for a second because it truly has changed the way I clean.. 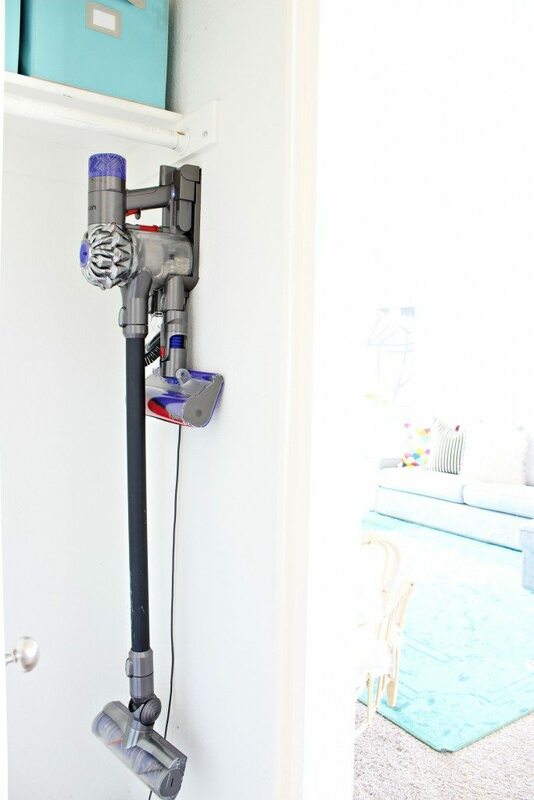 I have the Dyson V6 Absolute and it is my go-to, all-in-one, in a hurry cleaner. Yes, it’s a vacuum, obviously but it does SO much for quick cleaning that it is a game changer when it comes to cleaning, especially when you’re in a hurry and I feel like I’m always in a hurry! haha! 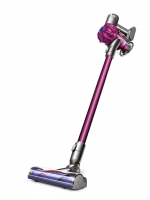 It has a soft roller cleaner head that it tackles both big and small debris. Rather than strips of hard bristles, the soft roller cleaner head has a full width roller, covered with a soft nylon material and rows of carbon fiber filaments. It helps me to tackle dust, small dirt, lint, etc. I clean virtually every surface possible with it. I then remove the long center pole attachment and attach the roller to the handle and clean my entire car in about 3 minutes. When you have to pick up family from the airport, you don’t want Cheerios, sand from the playground, and smashed goldfish crackers in the seats. I’m literally obsessed with it. After I get my car cleaned out, I usually spray it down with air fresher too! 3. 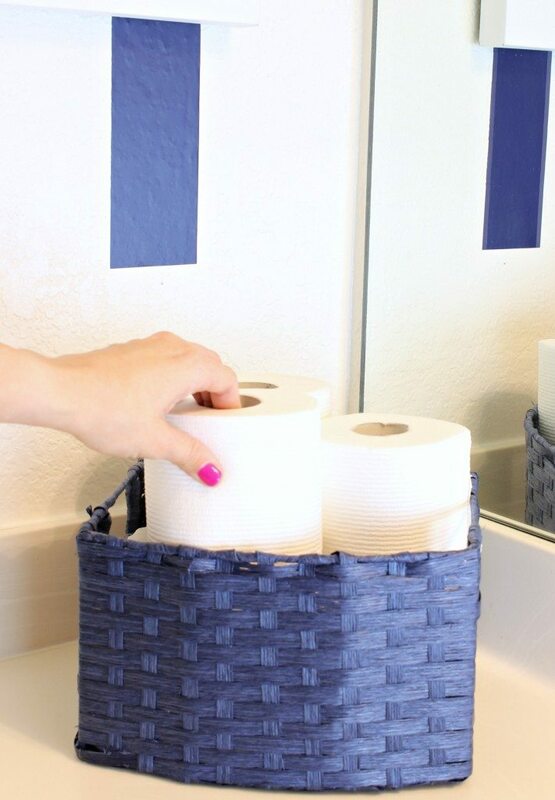 Bathrooms – First, I empty the garbage cans and I refill our extra toilet paper, hand soaps and we keep extra toothbrushes in the bathrooms too. My husband is a dentist so we have a lot of extras! ha! I want to make a guest box for the guest bathroom but I haven’t done it yet. A guest box is basically a box with an extra hair dryer, face wipes, feminine products, mouthwash, Q-tips or other common items that people (ahem…I) often forget when going out of town. 4. I change all of the sheets and pillow where guests may sleep and put fresh clean towels in the bathrooms. 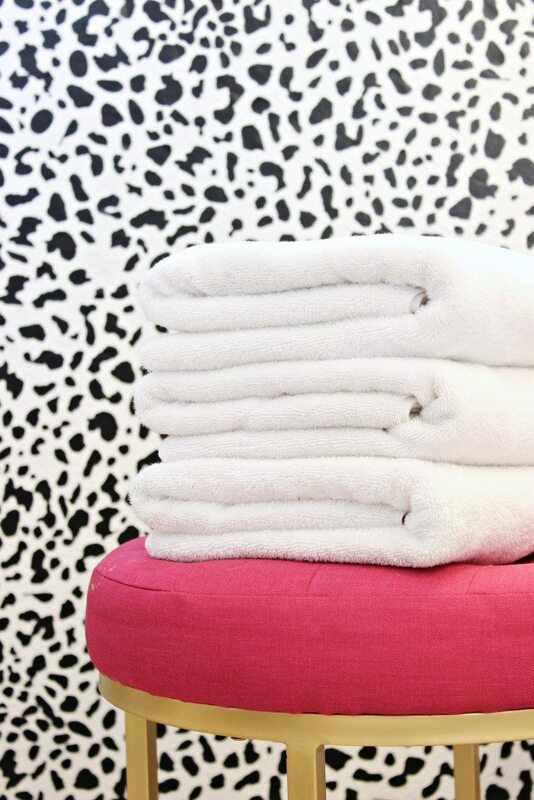 Love this list of quick ways to get ready for a guest! The vacuuming makes a huge difference, especially when you have little kids who leave crummies everywhere! I just had house guests last night. I love it. My kids are grown so I don’t have to worry so much about the clean up and my guest rooms stay ready all the time. A quick load of laundered sheets and towels, remake the beds and I’m ready!!! Good for you on the housekeeper. Money well spent I think. It is a luxury in some ways but so is the time you now get to spend with your family. I will have to disagree on Dyson. I bought a Dyson vaccuum and honestly we just threw it in the garbage and got a built in put in. This thing wouldn’t even pick up a piece of popcorn without clogging up completely. We have no kids at home, no pets so it isn’t like it was clogging with anything else. I spent more time taking it apart down to the screws every time I used it as something was always clogging it up. I washed the all the filters like I was supposed to. Kept the bin emptied. It was very expesive and basically useless. Now if you are happy with your unit that is great! This is just my experience with Dyson. It is nice when we find something that works well for us. Very Tidy, Mallory and Savannah. Such good tips for me because my wife has just giving a birth. I have to prepare for quite many relatives coming to say hello to my baby. Thanks for the tips.